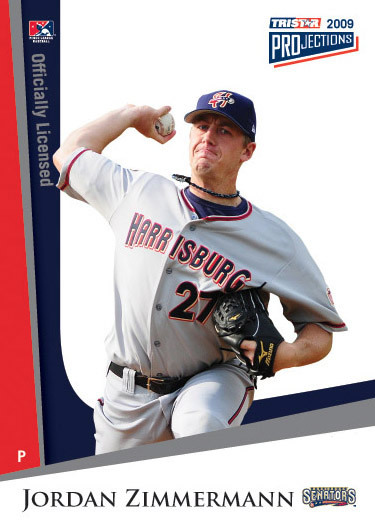 One of the bigger arms to come through Harrisburg belongs to the pride of Auburndale, Wisconsin, Jordan Zimmermann. The 6’2″ righthander started 20 games for the 2008 Senators compiling a 7-2 record with a 3.21 ERA and striking out 103 batters in only 106 2/3 innings. He’d return to City Island for one start in 2010 against the Portland Sea Dogs as part of his rehab from Tommy John surgery. Zimmermann has become one of the most underrated pitchers and a solid middle of the rotation starter for one of the best staffs in baseball. In 2012, he was 12-8 with a 2.94 ERA and saved perhaps his best performance for an electric one-inning relief appearance in Game 4 of the playoffs where he struck out the side. This entry was posted in Trading Cards and tagged Jordan Zimmermann. Bookmark the permalink.